The private sector must take the initiative on building skills, hiring and retaining more women in the workforce, and employing more people with disabilities, said Dipali Goenka, Chief Executive Officer and Joint Managing Director of Welspun India. One focus of this year’s summit was inclusion and changing attitudes, said Malvika Iyer, Member, Working Group on Youth and Gender Equality, United Nations Inter-Agency Network on Youth Development, adding that India has a long way to go in removing prejudice against those who are different. 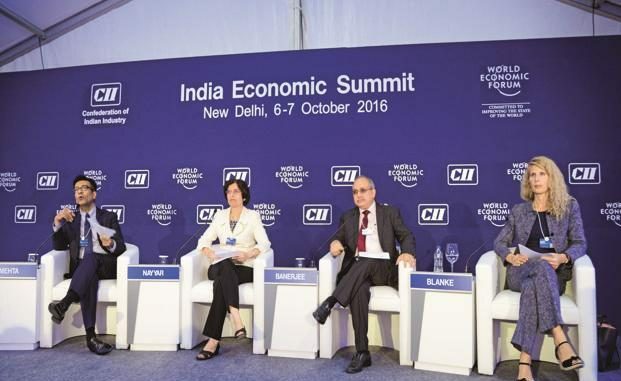 The India Economic Summit was hosted by the World Economic Forum and the Confederation of Indian Industry (CII) under the theme Creating Indian Narratives on Global Challenges. The summit, taking place in New Delhi on 4-6 October, welcomed more than 650 participants from over 35 countries. · The first-ever Open Forum India offered an unprecedented opportunity for the general public to participate in the summit. The session My India @2022 focused on the country’s demographic challenges. With two-thirds of India’s 1.3 billion citizens under the age of 35, the session explored how the country can create a future to which young people can aspire. Open Forum India was organized in partnership with the Department of Management Studies at the Indian Institute of Technology Delhi (IIT Delhi). · India is now one of the fastest-growing aviation markets in the world, with domestic demand reaching nearly 100 million passengers. Yet, annual international arrivals have remained relatively low, at 9 million. Against these findings, Indian policy-makers and industry experts are working towards welcoming over 15 million foreign tourists annually by 2025 and becoming the world’s largest aviation market by 2030. As part of this effort, the Forum launched the report Incredible India 2.0 – India’s $20 Billion Tourism Opportunity. It estimates that, with a growth in international arrivals to 20 million a year in India, the country’s tourism sector could incrementally grow by more than $19 billion and lead to the creation of up to 1 million additional jobs. · Nearly 100 leaders in India’s agriculture sector agreed to work on public-private partnerships that will contribute to Prime Minister Modi’s vision to double farmers’ incomes by 2022. The working meeting, co-hosted by the Ministry of Agriculture and Farmers’ Welfare and the World Economic Forum’s New Vision for Agriculture (NVA) initiative, included 12 state governments and three national ministries, Indian and global companies, technology innovators, farmer leaders, civil society groups and experts. The project will build on the experience to date in three states – Andhra Pradesh, Karnataka and Maharashtra – which have developed state-level platforms to drive agriculture value-chain partnerships with support from the NVA. · Urvashi Sahni of the Study Hall Educational Foundation (SHEF) is the India Social Entrepreneur of the Year 2017. The Schwab Foundation for Social Entrepreneurship honoured her exceptional contribution to achieving the Sustainable Development Goal of education by empowering India’s most disadvantaged girls. Aided by technology and partnerships with the state governments of Rajasthan and Uttar Pradesh, SHEF has worked with 900 schools, trained 5,000 teachers and impacted 150,000 girls directly and 270,000 girls indirectly affected by poverty and gender discrimination. · The World Economic Forum’s Primary Care Coalition (PCC) partners met at the India Economic Summit to validate a pilot project plan put forth in the Kullu District of Himachal Pradesh. Tata Consultancy Services, collaborating partners on the Primary Care Coalition, highlighted their Digital Nerve Centre, an open platform allowing for integration of existing expertise and activities such as vaccines, diagnostics and check-ups. The platform and PCC efforts have earned support from local and national-level officials, including the office of the Minister of Health. The Co-Chairs of the summit are: Ajay S. Banga, President and Chief Executive Officer, Mastercard, USA; Dipali Goenka, Chief Executive Officer and Joint Managing Director, Welspun India, India; Piyush Goyal, Minister of Railways and Coal of India; Smriti Zubin Irani, Minister of Textiles, Information and Broadcasting of India; Malvika Iyer, Member, Working Group on Youth and Gender Equality, United Nations Inter-Agency Network on Youth Development, New York; Karan Johar, Head, Dharma Productions, India; and Sunil Bharti Mittal, Chairman, Bharti Enterprises, India.